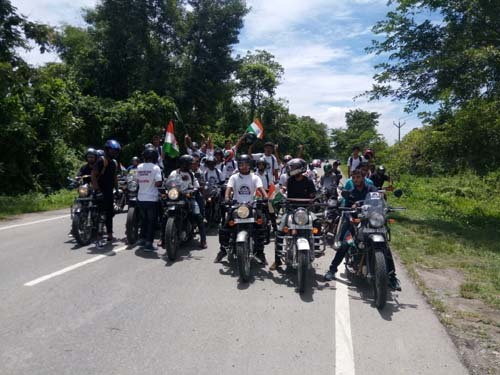 Celebrating the 72th Independence Day with fervor and zeal, youths of Ledo and Margherita town, Tinsukia district took part in a bike rally on the morning of Independence Day. The bike rally was organized under the guidance of security forces. The rally commenced at Ledo via Margherita and Jagun and ended at Ledo. Approximately 400 youths in 250 motorcycles took part in the event. The huge participation in the rally sends out a message that the youth have come up in solidarity to ensure peace and squash claims by the banned outfit to boycott the Independence day celebration. The patriotism and enthusiasm of the youth participating in the rally was mesmerizing and infectious. Encouraging camaraderie and faith among local youths, parties of both security forces and village youth could be seen patrolling around villages in the night of 14-15 Aug 18. The elaborate security arrangements ensured that the events were conducted without any untoward incident. The local populace appreciated the role played by armed forces in maintaining peace and helping civil administration in the area.